BIOFACH, held annually in Nürnberg, Germany, is the world’s largest strictly organic trade fair. 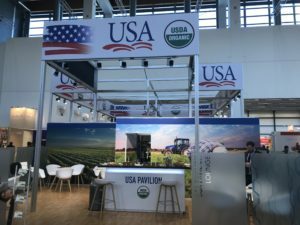 The next edition of this USDA-endorsedevent is scheduled for February 12-15, 2020, Exhibiting in the USA Pavilion provides greater visibility on the show floor and theconvenience of a turnkey booth package. 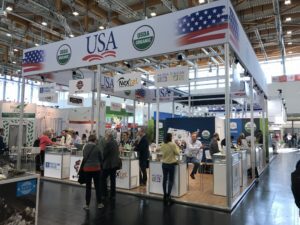 BIOFACH 2019 featured 3,273 exhibitors and over 51,500 trade buyers from 96 countries, including over 1,000 media representatives from 36 countries. 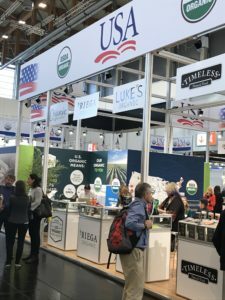 With the U.S.-EU Organic Equivalence Arrangement which entered into force on June 1, 2012, there are more opportunities than ever for U.S. organic companies to expand into the global markets. The U.S.-EU arrangement facilitates the trade in organic products between the world’s two largest organic markets. Previously, growers and companies wanting to trade products on both sides of the Atlantic had to certify to both U.S. and EU standards, which meant extra fees, inspections, and paperwork. Now, products certified in the United States or Europe may now be sold as organic in either region. The new arrangement is especially helpful to USDA/NOP certified small and medium-sized organic producers looking to start selling into the European market. For more information, please visit www.ams.usda.gov/services/organic-certification/international-trade/European%20Union. Did you know that you may be eligible to receive up to 50% reimbursement of trade show expenses through the Branded Program? All products on display must meet the organic requirements outlined by BIOFACH show management. In addition, all firms exhibiting in the USA Pavilion at a USDA endorsed show, must promote and display a majority of products greater than 51% by SKU count that are of U.S. origin. A product is determined to be of U.S. origin if is comprised of at least 51% U.S. origin content, by volume, or by value, exclusive of added water. In addition all exhibitors have to meet the BIOFACH admission criteria set by the organizers.